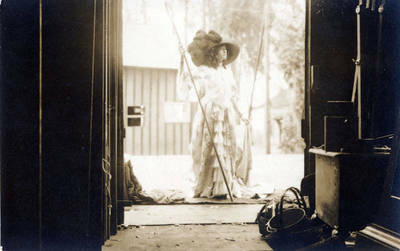 "Marguerite Snow as a shepherdess for Thanhouser film"
Marguerite Snow as a shepherdess in a Thanhouser California Company silent film, San Fernando Valley. May be a scene from "The Idol of the Hour," released March 14, 1913. BW photograph; 3.5" x 5.5"